Posted on April 2, 2019 at 3:00 pm. Rewarding women around the world that have endured the challenges of another gruelling Monday, Slots Million has come to the party in a big way with a Ladies’ Night special. Tonight between 7pm and 11pm, female players at the popular online casino will get a nice boost on their deposits. 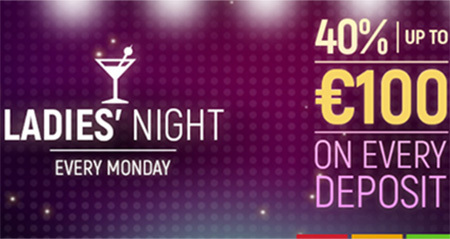 If you deposit in the time frame you’ll get an extra 40% to play with, up to a maximum of €100. The minimum deposit amount must be €25. The promotion is only valid on Mondays for female players who have made at least one deposit before today. SlotsMillion reserves the right to cancel or modify the promotion and its terms and conditions at any time, for any reason. It is the customer’s responsibility to check for changes and updates. SlotsMillion reserves the right to exclude any player from this promotion and to close their account and confiscate existing funds if evidence of abuse or fraud is found. Find out more at SlotsMillion.com, where new players can double their money up to $100 on their first deposit. 2013 - 2017 OnlinePokieGame.com. All rights reserved 18+ Gamble responsibly.